Topics: Bangkok Apartment, Bangkok Condo, Bangkok Apartment, Thailand Apartments, and Appartements à Bangkok. accomasia.co.th Accom Asia : Thailand Leader Real Estate Consultants. 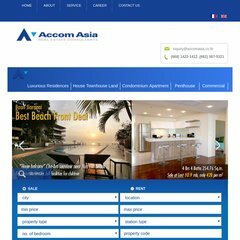 accomasia.co.th Apartment, House, Condo and Property Registration to professional ..
187 users visit the site each day, each viewing 2.60 pages. Accomasia.co.th's IP address is 203.150.225.92. Inet Idc Hq Vlan224 Bangkok is the location of the Apache server. It has 2 DNS records, ns2.datacenterthai.com, and ns1.datacenterthai.com. PING (203.150.225.92) 56(84) bytes of data. The server is slower than 77% of measured websites, at 1219 milliseconds. Also a time of 253 ms, is recorded in a ping test.